The Primary Learning Centre incorporates years 1-6 in a student friendly, open plan environment which has an open door policy. Parents are encouraged to be involved in their child’s learning through visiting the classroom, attending school events and the student communication diary. The aim of the Primary Learning Centre is to motivate and support students through a variety of learning programs and a Christ centred focus on everyday values and behaviours, to prepare them for a successful transition into the next stage of their education. Entry for students who haven’t completed the ABC’s Learning Program begins with a diagnostic test to determine the student’s chronological PACE (Packet of Accelerated Christian Education) level. This ensures that student’s begin at a level which suits their individual needs. Music – includes primary choir open to all students. Plus – Word Building, Literature and Creative Writing, Bible Reading and Animal Science. During the morning session which begins with daily devotions and prayer the students work in individual offices and focus on their PACE work. This allows them to work independently at their own pace. Teachers and teacher’s aides monitor the room closely at all times and are available to assist students when needed or for one on one student-teacher conferences, if students require additional assistance. Students use a system of flags and coloured cubes to signal that they require assistance. Students are required to complete a certain number of pages in their PACE’s each day. If they do not complete the required work necessary they then complete it as homework. There are a number of activities made available to students once daily goals are finished. Students are assessed via a PACE test at the completion of each PACE and are unable to progress until they have mastered the concepts covered in each PACE. This allows students to progress confidently to the next level and ensures that no student is moved forward until they are ready. One on one assistance is given to all students who have difficulty mastering any concepts. Teacher directed classes are spread throughout the remainder of the day and are designed to stimulate and engage students through a combination of practical and content based lessons. The Primary Learning Centre includes a library, computer lab and Interactive White Boards. Students are encouraged to work both independently and cooperatively and lessons are designed to meet the various learning needs of our diverse student population. The Primary Learning Centre reward system is based on a merit system where students receive merits, stickers and points for academic achievement, positive behaviours and memorization of the monthly Bible memory passage. This system encourages students in a positive, noncompetitive manner to reach their individual potential. 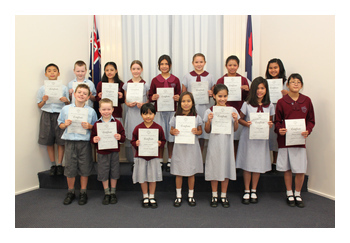 Each student is seen as valued member of the school community and is encouraged to achieve their best through Christ. The staff of the Primary Learning Centre recognises the important role they play in students’ lives and endeavour to act as positive role models at all times. Establishing a positive relationship between teacher and student is seen as an essential component in the development of a student’s attitude to learning. This role is seen by the staff of the Primary Learning Centre as both a privilege and a blessing.